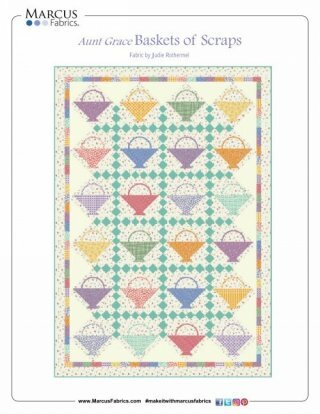 Free Projects & Patterns, Kits available call to order 231-271-0117. Up into the early 90s it was recommended to Pre-Wash all dark cottons to remove excess dyes. The Dying process has improved so that the US manufacturers say that isn’t necessary. It is still recommended for fabrics manufactured for companies from other countries and for unknown sources of fabric found in your stash etc. Because of the method used in dying Batiks, I recommend today’s darker ones be pre-washed alone with a dye catcher sheet. Only the gentlest of soap is recommended. Or no soap at all. That can be done by machine or for small pieces by hand. Today’s quality cotton fabrics produced in US manufacturers do not need to be pre-shrunk. HOWEVER, even the quality fabrics can be stretched as the 10 to 15 yard pieces are wrapped onto the cardboard bolts. That combined with the standard cutting method of any type of fabric stores today is the rotary cutter you can assume any fabric you buy is NOT cut on the perfect cross grain. Since most of today’s quilt patterns instruct you to cut strips across the width of the fabric you probably will end up with strips that are more on the bias than on the straight. Bias edges are subject to stretching. 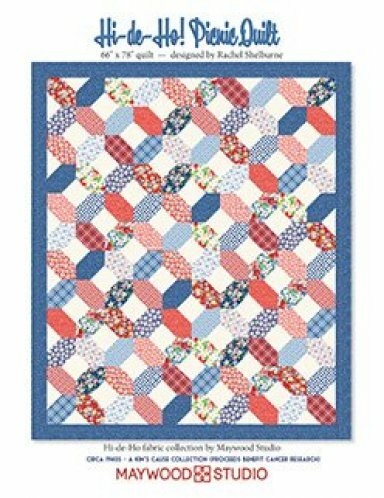 These strips used as boarders, sashing and large squares WILL cause your quilt to be out of square with ruffled edges. When hand quilting, we said those stretched areas could “quilt out”. 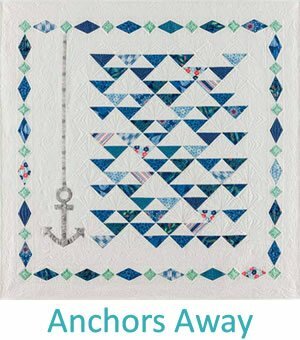 That is not possible with a long arm quilter. Just like your home sewing machine, a long arm will only add to the stretch of bias areas. Tear away one salvage edge. I leave the salvage that has the fabric information. Yardage of two plus yardage I run through the rinse cycle and dryer. Smaller pieces I lay on a table and with a spray bottle of clear water, wet the entire piece and allow it to dry in place. Being careful not to have any of the fabric hanging off the table or otherwise stretched. Allow to air dry. Smooth out fabric and treat with Best Press OR starch. If the pattern has a large percentage of bias seams I prefer undiluted starch. Be aware a quilt with starch should not be placed in closed storage. Be sure to rinse the quilt in the washing machine on gentle to remove starch first. After Best Press or Starch has dried, press, not iron. Light steam can be used. Trim the “bruised” edge of the torn salvage with ruler and rotary cutter. First cut boarders, sashing and other long pieces. I tear these long pieces about ¼” wider than the required finished widths, then trim to the correct size. Once I have the long pieces done I cut the smaller pieces, always keeping the longest edges of the smaller pieces on the straight of grain. For everyone’s safety, ALWAYS CLOSE THE ROTARY BLADE SHEILD after EVERY cut! Hold your ruler in place with a handle or at least the “spider” grip. Take care that your blade is snug against the EDGE of your ruler and NOT ON TOP of the ruler. Use new sharp blade for every new project. Cutting mat should be appropriate to the size of the piece to be cut. Smaller mats can be turned instead of moving the fabric to complete a cut. Even better use a rotary mat. Rotary blades and rulers should also be appropriate to the size to be cut. Lay up to 6 layers of fabric with the straight of grain along a mat grid line. Lay your ruler on top of the fabric area intended for the finished piece. While standing and looking straight down on the ruler adjust the ruler to the needed size cut. Double check that the ruler is straight to the mat grid lines as well as the fabric. Place the blade at the slight angle into the spot where the ruler meets the fabric. With light to medium pressure and moderate speed push the blade forward. Take care that you “walk” your fingers forward on the ruler to counter the pressure from the blade as needed. Be gentle handling with finished pieces with bias edges. 2.0 stitch length, size 75 sharp or quilting needle. Never universal, knit or stretch needles. Top Stitching needle can be used if larger eye is needed to see to thread. New needle for every project. Machine piecing thread 50 wt. home machine quilting thread 40 wt. Check stitch tension by sewing with a light and dark thread on 2 layers of fabric. Neither color should show on the opposite side. Adjust top tension before bottom tension. See service person if you are not confident in how to adjust tension. Is pressor foot tension correct for light to medium weight fabric? Mechanical machines sometimes have a numbered wheel to make the adjustments. Others only have a screw to tighten or loosen, The bulkier the fabric you are sewing the lighter the foot pressure should be. In addition to a ¼” foot with or without a fence, create a ¼” seam line as far ahead of your needle as possible. As you sew DON’T WATCH the needle. Watch the edge of your fabric and keep it lined up with the ¼” seam line several inches ahead of the needle. Do watch your needle as you stitch across points to insure your stitches kiss the end of the points. NEVER use a marker with chemicals in it. Lite Pencil and Chalk are the easies to remove. Chemicals have the possibility to return. At least only put chemical markers on top of starch so it will wash away. 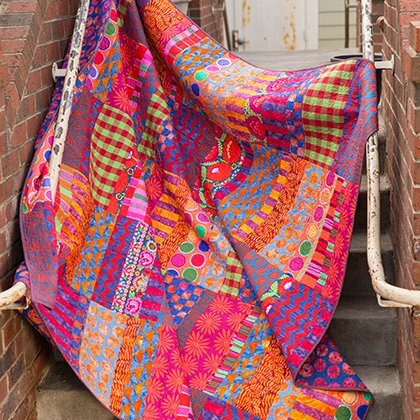 Free Spirit "Glow" Featuring Kaffe Fassett. Kit $121.36. 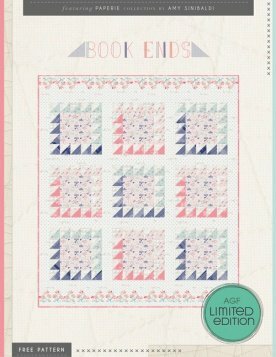 Featuring Paperie Collection by Amy Sinibaldi. Kit $50.20.